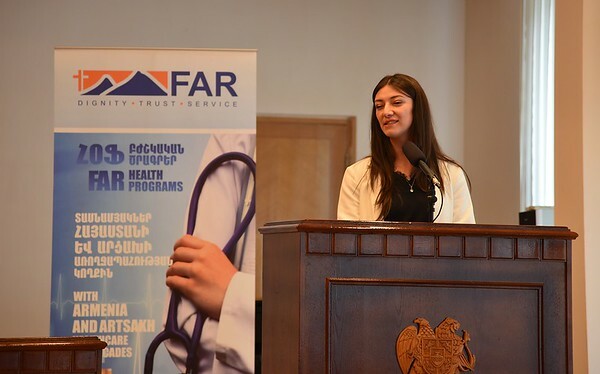 An October conference organized by FAR in Tavush Province highlighted the progress we’ve made in combating childhood malnutrition. The conference brought together representatives from health care centers, Tavush’s health department, NGOs and international organizations, kindergarten principals and community leaders to discuss how important good nutrition is for each child’s development, as well as for the economy and public health. FAR representatives presented on BCPP’s health component—its results and its prospects. Health and Social Programs Officer Vahe Krmoyan reported that seven kindergartens in the Berd Region of Tavush Province have been repaired or partially repaired through BCPP; five maternity training rooms have been established and equipped; and 16 kindergartens are now implementing a balanced food program that ensures every kindergartner receives a nutritious meal.